“The operation just ended and six terrorists were killed by police. Details on casualties will be announced later,” the spokesman, Sediq Sediqqi, said on Twitter. The insurgents had holed up in a multistorey building still under construction and launched their attack early on Tuesday afternoon, firing rockets towards the US and other embassies and the headquarters of Nato-led foreign forces. Afghan security forces backed by Nato and Afghan attack helicopters fought Taliban insurgents floor by floor in the building in the longest sustained attack on the capital since the US-led invasion a decade ago. One or two fighters held out overnight in the high-rise building, the site of the most spectacular of four co-ordinated attacks across the city. Suicide bombers had targeted police buildings in other parts of the city. At least nine people were killed and 23 were wounded in four attacks, and the ability of the Taliban to penetrate Kabul was a clear show of strength before a planned handover of security to Afghan forces in 2014. The insurgents were armed with rocket-propelled grenade launchers, AK-47 assault rifles and suicide bomb vests, a Taliban spokesman said. But the amount of time during which the squad held off foreign and Afghan troops prompted speculation they had access weapons and ammunition hidden in the building before the attack. Gunfire continued throughout the night, with residents of nearby buildings staying indoors with their lights off, as children panicked and helicopters flew low overhead. “It would go silent for 30 to 35 minutes and then there were explosions and the sound of heavy machine guns,” the Taliban spokesman said. Explosions were interspersed with gunfire all afternoon on Tuesday and several rockets landed in the wealthy Wazir Akbar Khan district, near the British and other embassies. One hit a school bus but it appeared to have been empty at the time. “There was almost certainly either a breakdown in security among the Afghans with responsibility for Kabul or an intelligence failure,” said Andrew Exum, from the Centre for a New American Security. On the day the attack started, a US Senate panel approved a $1.6bn (Â£1bn) cut in projected US funding for Afghan security forces, part of a significant reduction in outlays for training and equipping Afghan army and police expected in the coming years. The US and British embassies and the Nato-led coalition said all their staff were safe. Violence is at its worst since US-backed Afghan forces toppled the Taliban government in late 2001, with high levels of foreign troop deaths and record civilian casualties. The assault was the second big attack in the city in under a month after suicide bombers targeted the British Council headquarters in mid-August, killing nine people. 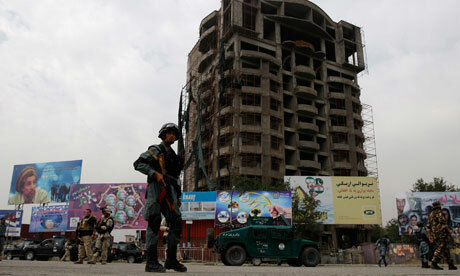 In late June, insurgents launched an assault on a hotel in the capital used by westerners, killing at least 10.